This gently cleansing, high-power spray is infused with seven sacred plants, including white sage, white pine, and solomon's seal. It brews for a full moon cycle for maximum potency, and can be used on tools, ingredients, or in a room to enhance the power of any working, no matter the intention. I use this spray for everything! 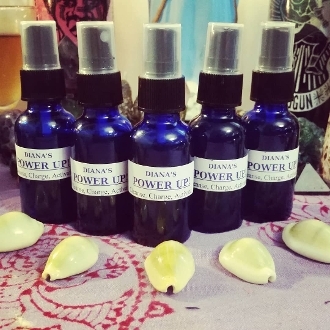 In the corners of a room before I work, on my space before a reading, and on any cloth, paper, or other ingredients that might need a little power up! It is highly neutral and will work with any energy you need at the time. 1 ounce, cobalt glass sprtitz bottle. LISTING IS FOR ONE BOTTLE.